Do you remember the magic of summer when you were a kid? The rigid structure of school days was replaced overnight by near-total freedom. I'm reliving those feelings by watching my daughter now. Last night she fell asleep on the couch watching reruns on late-night TV. For her, it was Full House and The Cosby Show. For me, a million years ago, it was Twilight Zone and Alfred Hitchcock Presents. Do you have any summer-freedom memories? Every crappy baseball team needs a curse, and now the Giants have theirs. When the Giants moved to their waterfront ballpark in 2000, the team engaged beloved ersatz priest Father Guido Sarducci and his team of Portuguese Water Dogs to retrieve balls hit into McCovey Cove. I was at the ballpark in a field box the day Father Sarducci and his dogs were introduced, and I got to shake his hand as he walked past. We used to like visiting the dogs on the portwalk before games. But things went sour when the Giants fired Father Sarducci, and the team has gone to the dogs. Will Father Sarducci and those beautiful dogs return to save the team? We'll see. When I buy my Intel-based Mac laptop next year, I want to run Mac OS X and Windows on it at the same time. There's no need for Windows (or Virtual PC) to emulate Intel/Windows hardware any more, because the actual hardware is there. In this dream, Windows/VPC is not running as an OS X app: it's full-on Windows with special magic stuff going on behind the scenes so it can talk to OS X. A configurable keystroke or gesture switches between operating systems, complete with a cube-flip animation. I can copy and paste between operating systems. Each OS has a window or some other proxy that represents the other, so I can drag and drop without switching. And if I hook up an external monitor, I can have OS X running on one and Windows on the other. And yeah, I can drag between them, like one big desktop. 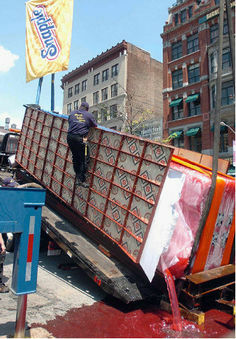 Snapple tried to erect a 17 1/2 ton popsicle in Manhattan's Union Square yesterday. In the summer. At noon. Almost predictably, the monstrous confection began to melt before it could be placed upright. Installation was halted. Goo ensued. The result was a sticky, kiwi-strawberry flavored flood. Ick. Yum. Ick. 1. "Frankly, my dear, I don't give a damn," Gone With the Wind, 1939. 2. "I'm going to make him an offer he can't refuse," The Godfather, 1972. 3. "You don't understand! I coulda had class. I coulda been a contender. I could've been somebody, instead of a bum, which is what I am," On the Waterfront, 1954. 4. "Toto, I've got a feeling we're not in Kansas anymore," The Wizard of Oz, 1939. 5. "Here's looking at you, kid," Casablanca, 1942. 6. "Go ahead, make my day," Sudden Impact, 1983. 7. "All right, Mr. DeMille, I'm ready for my close-up," Sunset Blvd., 1950. 8. "May the Force be with you," Star Wars, 1977. 9. "Fasten your seatbelts. It's going to be a bumpy night," All About Eve, 1950. 10. "You talking to me? ", Taxi Driver, 1976. 36. "Badges? We ain't got no badges! We don't need no badges! I don't have to show you any stinking badges! ", The Treasure of the Sierra Madre, 1948. 79. Striker: "Surely you can't be serious." Rumack: "I am serious ... and don't call me Shirley," Airplane!, 1980. 82. "Toga! Toga! ", National Lampoon's Animal House, 1978. A chunk of Silicon Valley history has disappeared with the closing of Hyatt Rickey's in Palo Alto. Known in a previous, less brand-conscious era as Rickey's Hyatt, this rambling garden hotel has been a landmark for more than 50 years. My favorite Rickey's memory is from 1982, when I was an Apple Sales Support Analyst -- that is, a nerd who helped Apple sales reps. After signing an NDA (my first ever), I was allowed into a ballroom filled with Lisa computers. I sat down and gaped in awe at the wonders of a graphical user interface. This was two months before the Lisa shipped, 14 months before the Mac, and I had only seen such things in the pages of magazines. I grabbed the mouse and played with LisaCalc, LisaWrite, and the rest, all day long and into the night. I opened the Clock, covered it partially with a window, and watched in amazement as the second hand disappeared and then reemerged during its sweep around the dial. Goodbye, Rickey's Hyatt. Hello, 185 new homes that will take its place. The History and Literature of Baseball is a course taught at San Francisco State by noted author and historian Jules Tygiel with Eric Solomon. The class connects baseball to history, according to Prof. Solomon, through "the essential themes of American literature -- tragedy, comedy, life, death and the seven deadly sins. What we intellectuals love about baseball is that it's a narrative: Each game, each inning, each at bat is its own narrative." Robert Coover, The Universal Baseball Association, Inc., J. Henry Waugh, Prop. If you're a Sports Illustrated subscriber, you can read more here. Fox has launched the inevitable all-reality show channel, Fox Reality. The schedule shows lots of dating and cops & robbers shows, repeated many times. Yes, it looks like fun for the whole family. Fox Reality is channel 250 on DirecTV and is coming to Dish Network and various cable systems soon. Steve Jobs gave the commencement address this year at Stanford, and got surprisingly personal.